Nelson Mandela, pictured with his wife Winnie, after his release from prison. Four years after Mandela was released from prison, he was president. And yet, those four years were also among the bloodiest and most painful for all South Africans – black and white – as they struggled toward the transition to majority rule. 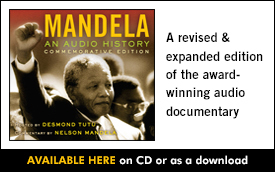 On our podcast we have been revisiting chapters from our series Mandela: An Audio History. Today we bring you Chapter Five: From Prison to President.